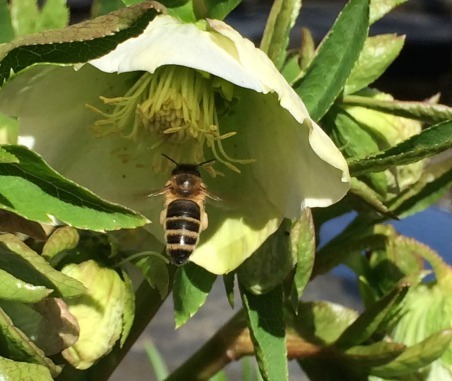 Honey bee dancing is one of the most fascinating behaviors in animal life and a model of animal communication. Performed by a worker bee that has returned to the honey comb with pollen or nectar, the “dances” or movements constitute a language that “tells” other workers where the food is. By signaling both distance and direction with particular movements, the worker bee uses dance language to recruit and direct other workers in gathering pollen and nectar. The late Karl von Frisch, a professor of zoology at the Universityof Munich in Germany, is credited with discovering and interpreting the meaning of honey bee dance movements in 1947. After decades of research, he and his students documented and described the different parts of each dance. Using glass-walled observation hives and paint-marked bee foragers, they trained the foragers to find food at sources placed at known distances from the colony. When the bees returned from gathering food from those sources, the duration and angle of the dances was carefully measured. Their findings led them to the concept of a dance language. Von Frisch’s work eventually earned him the Nobel Prize in 1973. The waggling is done so quickly, that it looks not like a figure eight, but a “waggle” of the rear end. Check out my video of bees doing the waggle dance. Look closely and you will see several instances of it happening. The first one starts around 30 seconds in. 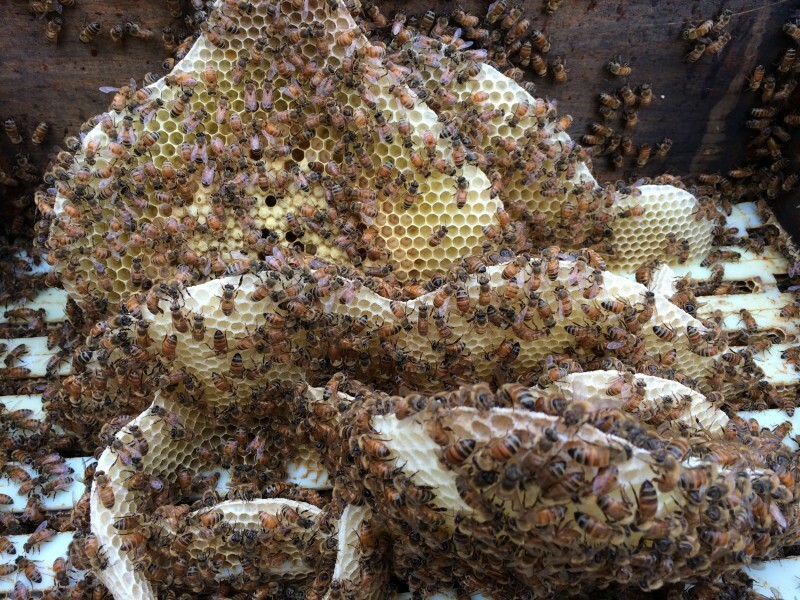 When an experienced forager returns to the colony with a load of nectar or pollen that is worth a return journey, she performs a dance on the surface of the honey comb to tell other foragers where to locate the food. The dancer “spells out” two items of information—distance and direction—to the target. Recruits then leave the hive to find the nectar or pollen. There are two types of dances – the round dance and the waggle dance- with the round dance being a shorter version of the waggle and indicating food is nearby. Distance and direction are relayed in different ways in the dance and now it is believed that odor plays a large part of this behavior. Some scientist believe that the dance is only to get attention, and then the accompanying odor gives more exact information. 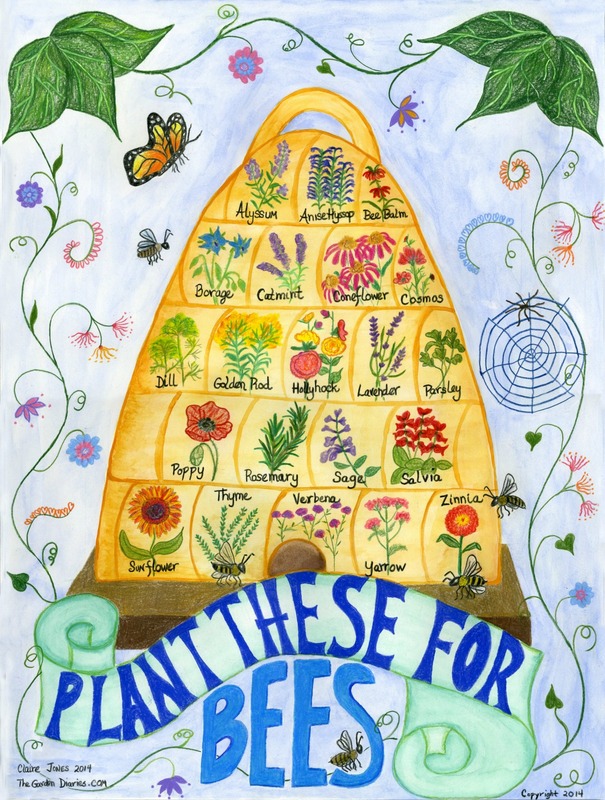 Flowers for pollination poster available at https://www.etsy.com/listing/182225449/18-x-24-pollination-poster-plant-these? As the distance to the food source increases, the duration of the waggling portion of the dance (the “waggle run”) also increases. The relationship is roughly linear. For example, a forager that performs a waggle run that lasts 2.5 seconds is recruiting for a food source located about 2,625 meters away. The orientation of the dancing bee during the straight portion of her waggle dance indicates the location of the food source relative to the sun. The angle that the bee adopts, represents the angle to the flowers relative to the direction of the sun outside the hive. In other words, the dancing bee transposes the solar angle into the gravitational angle. Fascinating stuff! All the known species of honeybees perform these dances in some form that varies slightly from species to species. Such species-specific behavior suggests that this form of communication does not depend on learning but is rather determined genetically. This is so interesting and educational! Thanks, I love blogging about bees as they are fascinating creatures. What is the project and where? I would love details! MarketPulse is a overseas trade, commodities, and world indices evaluation, and foreign trade news website offering well timed and correct information on primary financial developments, technical evaluation, and worldwide occasions that affect utterly completely different asset programs and consumers. If the required information is not going to be supplied, the University may not contemplate the reentry request. Because of this, changes in autonomic nerve function can significantly impact reentry mechanisms, either precipitating or terminating reentry.